This website is built using Hugo and deployed on Netlify. I’ve been very happy with both of these technologies since deciding to use them. I did find the Hugo documentation somewhat impenetrable: all the information and detail is there, but it’s a steep ol’ curve for a newcomer. I’ve surmounted that curve and this site now features statically hosted blog comments - including moderation functionality. This post aims to step through the required config and to point out some salient points. The configured system uses Netlify Forms and Functions add-ons. Both of these are free for low volume usage. Comment notification and moderation relies on Slack which is also free. The form contents are posted to Netlify as the form has a netlify attribute and stored in a Netlify table called pending-comments. The insertion of a table entry triggers a Netlify Lambda function called comment-submitted. The Lambda function posts the comment data via the Slack API to a simple Slack App. My app is called vectronic-comment. The Slack App posts the comment to a Slack channel with user actions provided to either “delete” or “approve” the comment. My channel is called #vectronic-comment. The user action invokes a Netlify Lambda function called comment-action. If the action was “delete”, the function calls the Netlify API to delete the entry from the pending-comments table. If the action was “approve”, the function calls the Netlify API to move the entry from the pending-comments table to the approved-comments table. The insertion of a table entry triggers a Netlify build via a Build Hook. Uses the Netlify API to grab all of the approved comments from the approved-comments table. The comments are placed in a map using the blog post as a key and written to a data file. The Netlify build then runs Hugo which uses the data file as a data source for each of the generated post pages. 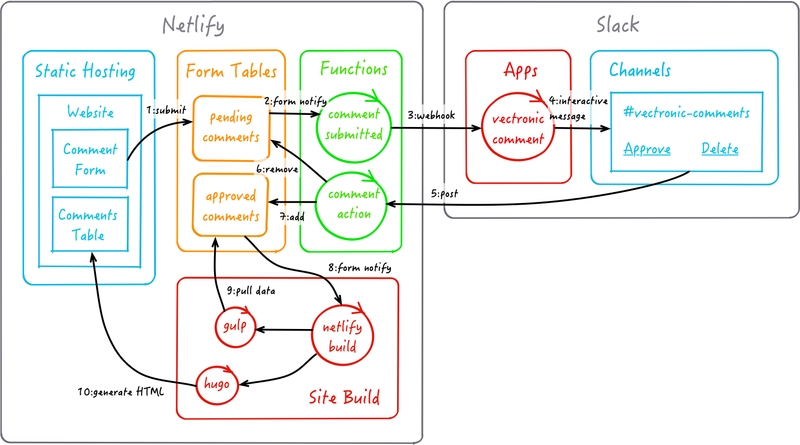 Presented below is a fairly terse outline of the configuration required in Slack and Netlify. Configure a Slack App for your workspace. Mine is called vectronic-comment. Add an Incoming Webhook to the app which will post messages to a channel. My channel is called #vectronic-comment. Install the app in your Slack workspace. The above should allow posting comment details via the Slack API to a channel in your workspace. The comments will appear as interactive messages with actions to click on. Clicking an action will post back to the configured Netlify Function. For the pending-comments table creation, just submit a test comment using your website comments form. Ensure the HTML form has a name of pending-comments and the attribute netlify set. Once a test comment is posted, you should see a pending-comments table in the Netlify admin UI and will be able to configure notifications for it. Entries in the approved-comments form table are only added via Slack integration calls to the Netlify Lambda function comment-action. But again, this table needs to be created in Netlify first so that notifications can be configured for it. The easiest way to achieve this is to temporarily deploy a website page which contains an appropriate HTML form having a name of approved-comments and the attribute netlify set. Once a test comment is posted, you should see an approved-comments table in the Netlify admin UI and will be able to configure notifications for it. The approved-comments HTML form can then be commented out or removed from your website source. At the user account level in Netlify, create a new OAuth application personal access token. Mine is called vectronic-comments-management. This Personal Access Token will be used when making calls to the Netlify API from Netlify Functions. The Netlify Personal Access Tokens configuration page can be found here. NETLIFY_API_AUTH - The personal access token created in the Netlify OAuth applications section. Account -> Site -> Forms -> approved-comments. SLACK_COMMENT_WEBHOOK_URL - The incoming webhook URL provided for your Slack app when the Incoming Webhook was added to it. VECTRONIC_FUNCTION_AUTH - This can be any shared secret key. It is used to prevent access to the publicly exposed Netlify Functions (more on this below). The above can be set in the “Continuous Deployment” settings section of the Netlify website admin UI. Define a Build Hook which will be used to automatically rebuild the site when a new comment is approved. Mine is called build-vectronic. On a new form submission to the pending-comments form, post to the comment-submitted function configured in Netlify e.g. On a new form submission to the approved-comments form, post to the build hook configured in Netlify. The above can be set in the Form notification settings section for your Netlify website. Presented below are the salient points of implementation that work in conjunction with the above configuration. I believe these are fairly self-explanatory. If they’re not, post me a comment! I believe this is fairly self-explanatory. If not, post me a comment! I have previously read some criticisms of the approach described here with respect to its ability to scale e.g. many posts requiring many website rebuilds, the time taken to rebuild, the need to moderate each and every comment etc. etc. For me, with currently around 4 posts and 0 comments, its fair to say this isn’t a concern. I will be happy when it does become a concern! When it does become a concern and I embark on implementing a more scalable solution, I’m happy to know I will have all of my comment data available: both in static rendered form and as raw data available via the Netlify API.